On November 8, 2011, a delegation of 15 representatives from the Food and Drug Administration (FDA) visited the Sheikh Zayed Institute for preliminary discussions of possible collaborations and exchanges. The group was led by Susan Cummins, MD, MPH, Chief Pediatric Medical Officer at the Center for Devices and Radiological Health (CDRH). In August 2010, Dr. Cummins became the first “Pediatric Champion” at CDRH, bringing with her more than 25 years of public health practice experience, including nearly eight years with the pediatric program and Drug Safety Oversight Board within the FDA Center for Drug Evaluation and Research. The day began at 10am, with introductions and general discussion of programs, initiatives, and possible synergies. Our visitors were then led on tours of the Division of Diagnostic Imaging and Radiology as well as the Sheikh Zayed Institute, including the bioengineering lab where they were shown some of our work involving 3D imaging and robotics. At noon, as part of the Institute’s Innovation Rounds, Dr. Cummins provided a brief overview of some processes and regulations at CDRH, along with their rationale and function. 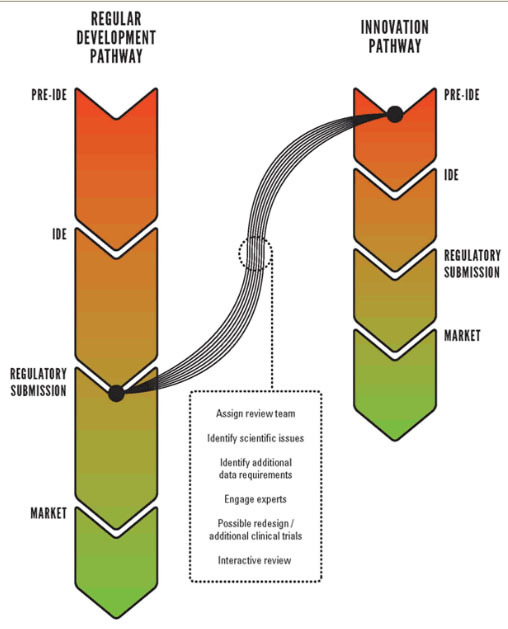 She also spoke to the recent Institute of Medicine recommendations regarding the 510(k) pre-market clearance for new devices and how it impacts their development. More than 50 Children’s National faculty and staff attended this interesting lecture. Dr. Cummins was joined by two of her colleagues; Megan Moynihan, Acting Associate Director for Technology and Innovation at CDRH and Linda Ulrich, MD, a medical officer in the Office of Orphan Products Development and Director of the Pediatric Device Consortia Grant Program since its inception in 2009. Ms. Moynihan presented the Innovation Pathway Project, a priority review program launched in February. It is designed to encourage cutting-edge technologies among medical device manufacturers and to strengthen the nation’s research infrastructure. 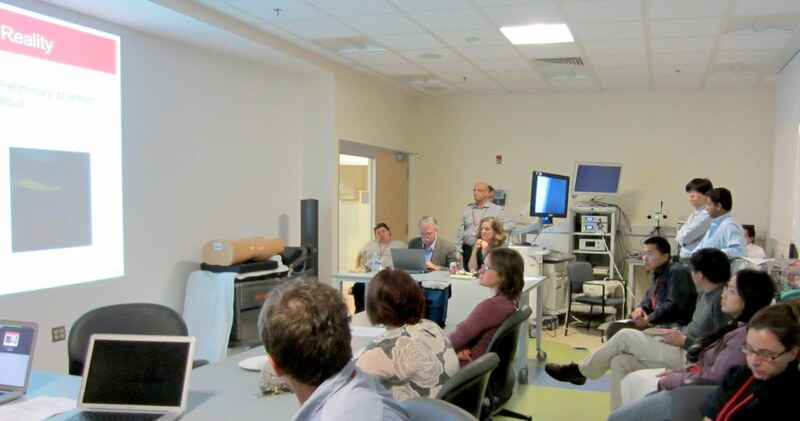 One of the objectives of this exciting new initiative is to make publicly available a core curriculum covering the areas of device design and engineering, pre-clinical testing, clinical evaluation, regulatory processes, and post-market monitoring. Dr. Ulrich explained that the Pediatric Device Consortia Grant Program was established by the Pediatric Medical Device Safety and Improvement Act 2007. The program’s mission is to establish nonprofit consortia to stimulate pediatric device development. Three consortia were funded in 2011 and more than 100 pediatric device projects have been assisted in their development so far. The FDA representatives stayed after lunch to answer questions. The overall impression given by this visit is that the FDA—and in particular the CDRH, the home of almost all of our guests—is a vital, dynamic place staffed by individuals eager to make a difference through their work. Their engagement with innovative thinking and practice is inspiring. At the end of the day, we were invited to come to their offices to continue discussing opportunities to work together. We look forward to that visit to their new offices in Silver Spring, and plan to report on it in the near future. On Thursday, October 27, the Sheikh Zayed Institute held the first Bioengineering Showcase to demonstrate some current projects. Below are some images from the team demonstrations to give you a flavor of programs underway at the Institute. It was standing room only during the showcase overview that kicked off the event. 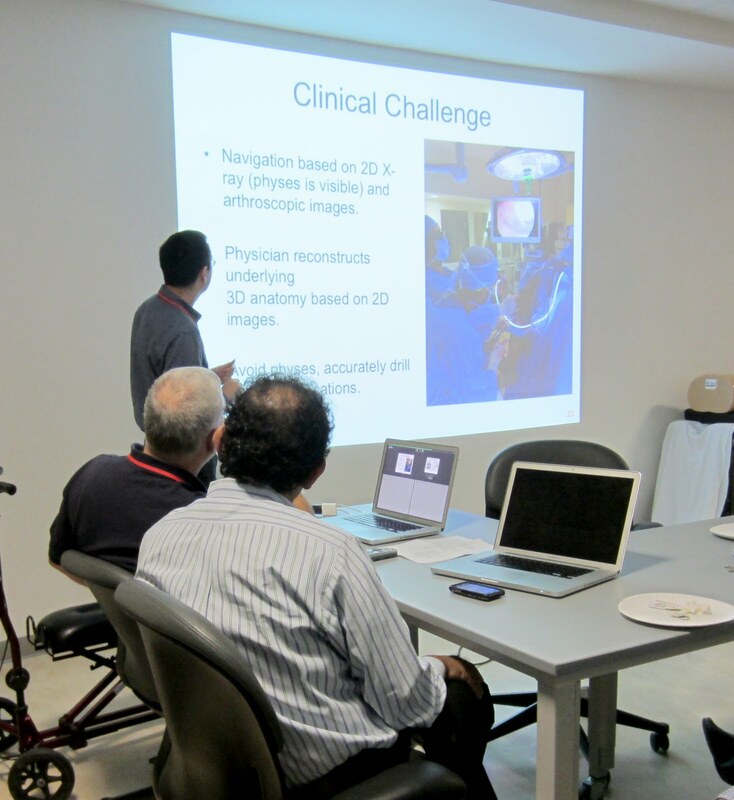 Faculty engineer Ziv Yaniv, PhD, talks about the clinical challenges of two-dimensional imaging in surgery. Institute researcher Emanuel Wilson demonstrates the novel robotic control system for flexible endoscopy, a unique device developed at the Institute. 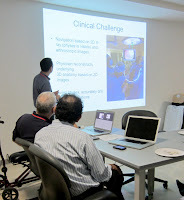 Robert Fellow Mahdi Azizian, PhD, demonstrates what three-dimensional imaging might look like during surgery. 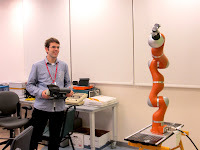 Another Institute researcher, Risto Kojcev, shows off the newest addition to the bioengineering lab, a KUKA seven degree of freedom robot arm, which is pressure sensitive and might be used one day for routine tasks like sutures.